Young shepherd Daw (Megan Graves) and her sheep (designed by Aaron Cromie) greet Mary (LIlian Oben) and child, with a shepherd (Daniel Meyers) looking on in The Second Shepherds’ Play. On stage at Folger Theatre, November 27 – December 21, 2016. Photo by Brittany Diliberto. 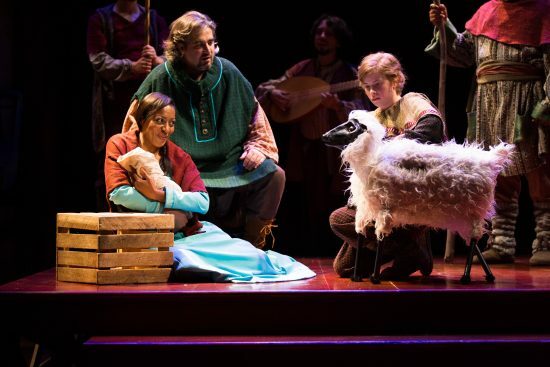 “The Second Shepherds Play,” now playing at Folger Theatre through December 21, 2016 is a magical retelling of the Nativity story which combines beautiful music and a moving story, perfect for the holiday season. Revived by Folger Consort from its 2007 production, this engaging medieval mystery play and its festive English music of the period beautifully weaves together the stories of the shepherds, a sheep thief and his cunning wife, and the miracle in a humble manger in Bethlehem. Part of what makes this retelling of the Nativity story so magical is the puppets designed by Aaron Cromie. 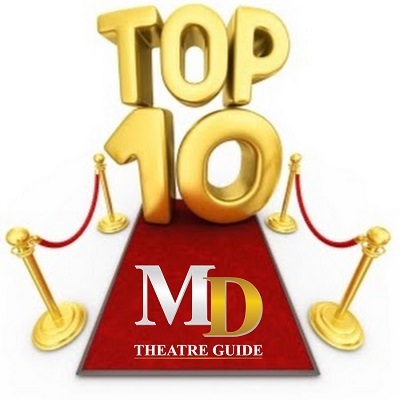 Mr. Cromie took the time to speak with MD Theatre Guide about his role as puppet designer for the production. MD Theatre Guide: How did the time period and location of this medieval mystery play influence how you designed and constructed the puppets? Aaron Cromie: The director, Mary Hall Surface, wanted something that would suggest the handmade quality of medieval crafts, but also possess a warmth and ‘alive-ness’ and performability for the action that the scenes require. Malinda Kathleen Reese and Lilian Oben work the terrain for the three shepherds’ journey in The Second Shepherds’ Play. On stage at Folger Theatre, November 27 – December 21, 2016. Photo by Brittany Diliberto. MDTG: How does the use of puppets enhance the telling of the story in The Second Shepherds’ Play? AC: Puppets do in a theatre what people can’t – puppets fly, split apart, climb mountains, swim seas – in miniature form. You’ll have to come and see the show to see all of what they’ll be doing. Also, sheep are loose cannons – it would be pretty difficult to work with a live sheep…. MDTG: Tell me about the sheep puppet; its character, how it moves and interacts with the performers. How long did it take to construct? AC: The sheep is operated by one of the performers. 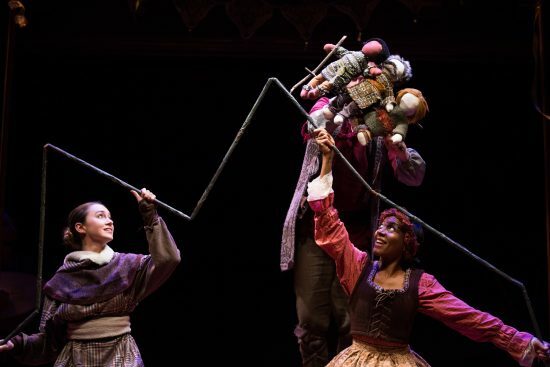 Not only is the sheep puppet cute and funny in its own right, but the performer playing it has the opportunity to reflect a gentle emotional life through her performance – adding an element we wouldn’t necessarily experience with a real sheep. The puppet itself took several hours over many days to construct, and is made of faux fur, plastic, rope paper mache…and a lot of elbow grease. MDTG: Where did you learn to design and construct puppets? Do you have a particular philosophy or goal when designing the puppets? AC: My experience with puppetry began with a company (now defunct) called Mum Puppettheatre which was led by an excellent artist named Robert Smythe (a terrific designer, director and performer who works all over the region) with whom I learned styles of performance and some methods of puppet construction. Subsequently, I studied mask making at the Dell’Arte International School of Physical Theatre and then in Italy with master teacher Antonio Fava. All along the way I taught myself some methods and did a lot of experimentation with styles and materials. I still have a lot to learn. I’d say my goals are always to create artistic solutions for the challenges of any given show. Additionally, I enjoy the demystification of the process (offstage), so that fans of puppetry can see how things are done. I love to share whatever know-how I can.